Web Reporting system provides an accessible, intuitive dashboard making your energy data available to the entire organisation. Discover how Web Reporting can help get your stakeholders engaged with Energy Management. The Web and Dashboards module provides access to your organisation’s energy data to a much wider audience via a web browser. Dashboards can be easily configured using an extensive library of widgets resulting in a clear engaging representation of a sites energy data. Drill down functionality allows a user to interrogate further if they wish, thus delivering different hierarchies of energy information to suit the respective user at the click of a button. 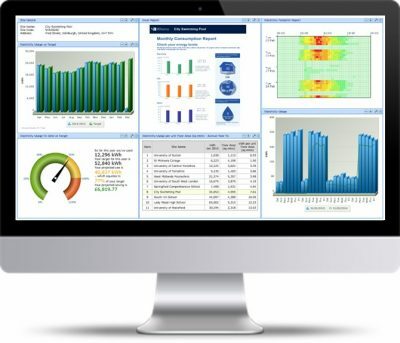 The Web and Dashboards module is fully integrated with the rest of the Systemslink Energy Manager software suite so that data collected via the AMR data collection service appears on the Web as it is collected, and any data changes in the Energy Manager package are automatically updated on the Web as they occur. At Warwickshire County Council, we use the Web Module to give our customers quick and easy access to their utility data. The easy to configure Dashboards provide a suite of tools ‘out of the box’ which allows us to communicate this information using clear, user-friendly graphic formats. In addition to our eye catching dashboards the Web Module also contains a library of reports which allows individual users to focus in on the information related to their site or group of sites. These include cost and consumption, comparisons to budgets and targets and a number of easy to access monitoring and targeting tools. The custom Excel reporting functionality in our Energy Management package and its seamless integration with our Web and Dashboards module, means that any custom Excel report can be uploaded to the web as its own widget. This means that you can easily design and build your own widgets tailored to your organisation’s needs, which are automatically updated as new data is collected. Sign up to our newsletter to receive a monthly roundup of the latest industry & software news. Follow us for the latest software news. © 2018 SystemsLink 2000 Ltd. All Rights Reserved. Join the growing number of organisations using SystemsLink, to save energy and reduce carbon emissions.